5.1 Home Cinema system, Lands Lane, Knaresbourough. I was watching ‘Polar Express’ by Christmas as promised, Excellent Service! 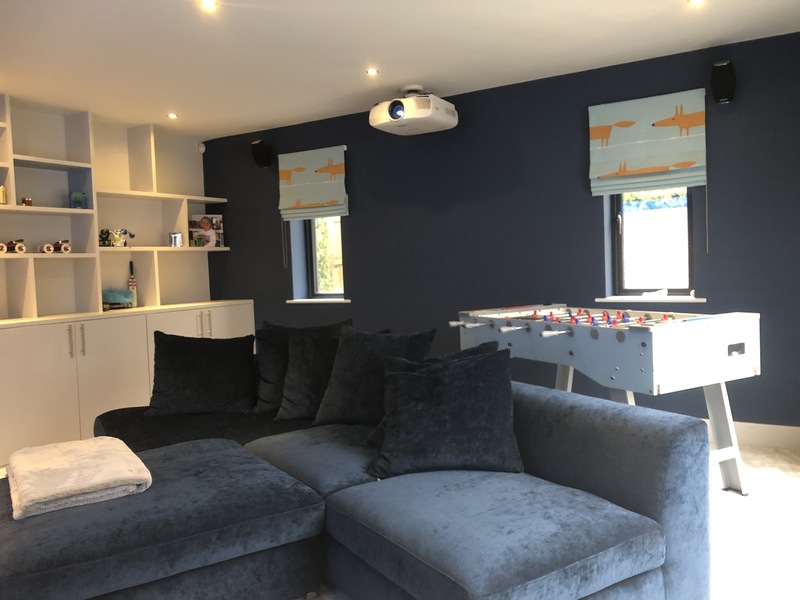 Anthony was keen to convert his childrens playroom to a more family orientated space. By Anthonys own admition the room had started to take on the apperance of Toys ‘R’ Us. 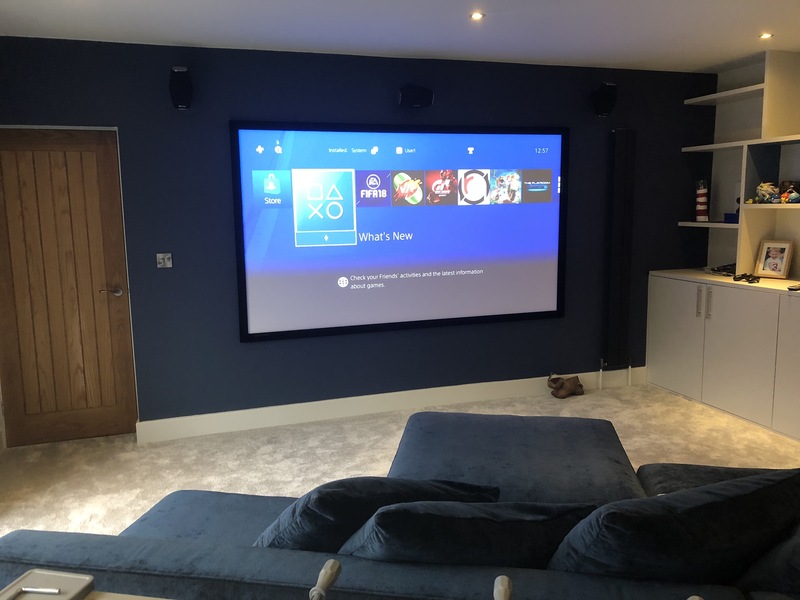 Anthony wanted cupboard space installing for toys & game storage but wanted the room to be so much more than just a TV on the wall for playstation use. 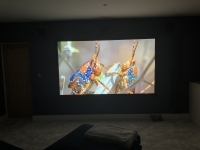 After experiencing Home Cinema at a friends house, he was set on a Home Cinema projection system but wanted the system to fit to a certain budget. The very first thing we suggested was a visit to our showroom on Hornbeam Park to aid with decision making. Anthony was set on a large projection screen with a plush velvet black border and liked the Epson projectors vibrant HDR colour. As Anthony had a budget for us to work within we specified a package to suit. We provided Anthony with contact details for a carpenter to contruct the cupboard as described, the cupboard’s main intention was to store the childrens toys and part was set aside for the AV equipment, as the room was an existing finished room we knew we had to be discreet about installing the cables for the speaker system and projector, this was acheived by rodding behind the dot and dab plasterboard with minimal patching up to do afterwards. You would never know what we had to do now that the room has been decorated. It was important for us to coordinate with both the carpenter, decorator and carpet fitter to ensure the project moved smoothly. The only real trick for us was getting a HD picture from the Sky HD box which was situated in the garage supplying other TV’s in the house. The only way this was to be acheived was by installing a run of exterior grade Cat6 cable around a short outside route. The cable is hardly noticeable. We are able to send the HD picture using a pair of HDAnywhereHDMI to Cat6 sender and receivers, these also carry the Infra Red signal to operate the box efficiently. 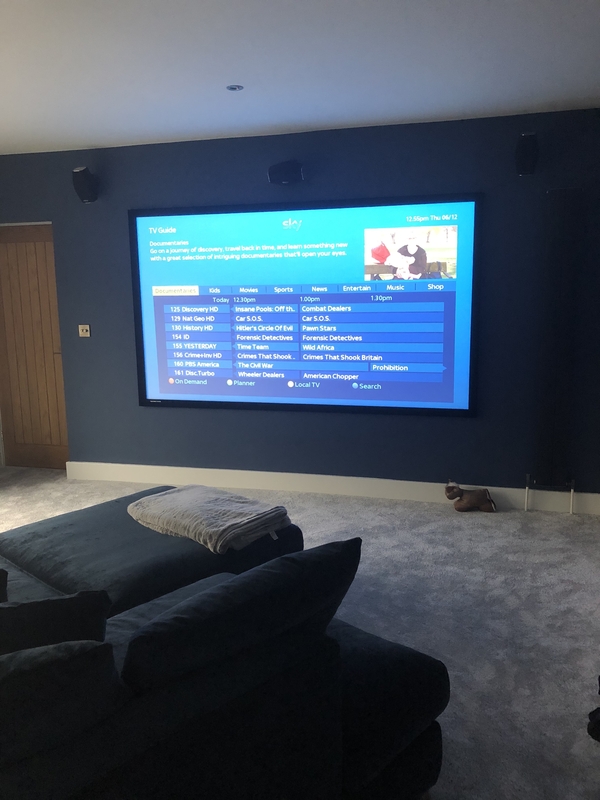 The main use for the Home Cinema system is obviously family time watching Movies, it was fantastic to receive an sms photo of the family enjoying the room for the first time. 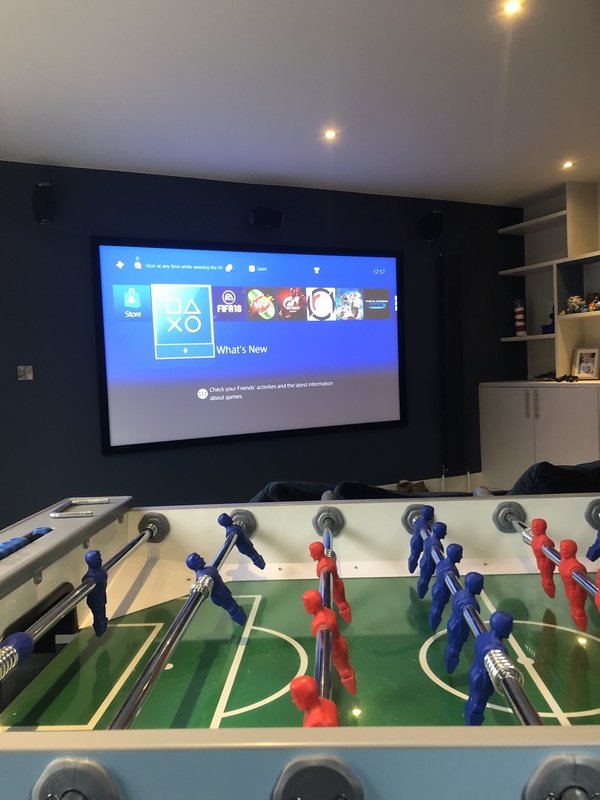 They are also enjoying the system for Playstation Gaming along with general Sky TV viewing and of course Anthony has plans to have the guys round for the live Football. The Children now call it the ‘Best room’! 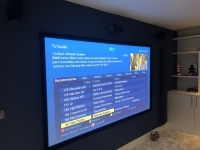 The project was a joy to work on and along with Anthony we are really pleased with the results.